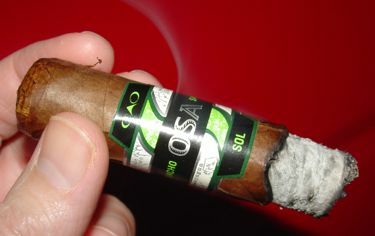 This mysterious cigar, first reviewed in April 2006, is from a 2005 box that has an uncertain history. When I first purchased these from JR Cigars I could find no listing for St. Luis Rey Cazadores anywhere except JR, and nothing has changed since then. 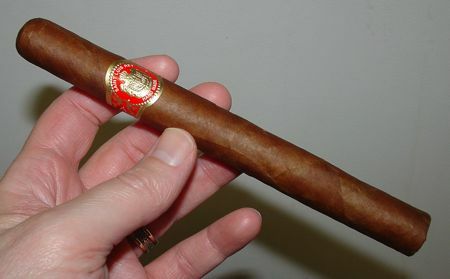 (They are unlisted by the manufacturer, Altadis USA, though JR still lists them as “Out of Stock.”) The current SLR is a medium-bodied multinational blend with a Nicaraguan wrapper, while this one is still a full-blooded full-bodied Honduran. 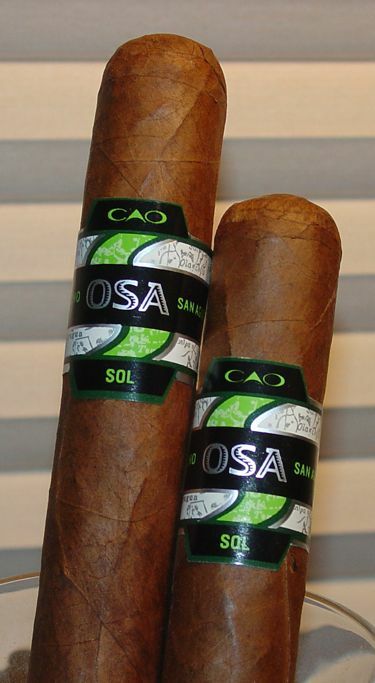 The “Cazadores” is a traditional Cuban production vitola — the Cuban Romeo y Julieta is probably the best known example — but this double corona sized cigar doesn’t even come close to meeting the traditional 6 7/16 x 44 Cuban format. So why this cigar is called a “Cazadore” is as confounding as the fact that it no longer exists, because it’s a nice full-bodied cigar that so far is aging beautifully. Aesthetically this old SLR is gorgeous — a smooth leathery colorado wrapper that has few veins and almost no imperfections. The roll is perfectly consistent and the head is flawlessly shaped and wrapped. The one surprise is the lack of a triple cap — with a roll this perfect I’ve come to expect one, even if here it really isn’t necessary. The middle third is meaty and rich — just what I’m looking for from a Honduran cigar. The aroma takes on a woodier aspect at this point with a dash of cinnamon. I didn’t note this in the earlier review, and digging through the cluttered humidor of Smokes Past I’m not finding any memories of such subtleties. The last third returns to darker peppery flavors and leather, getting stronger by the inch. I was hoping that this cigar would have mellowed a little in this regard, but after three years it’s still in fighting form. My experience with aging cigars has so far shown that after a year or two the most noticeable change is in potency — I’ve seen this with the Camacho Havana (6 years) and the Angel 100 (2 years) and with several other brands over shorter periods of time. Strength diminishes and subtler qualities emerge. For the most part the Saint Luis Rey Cazadore is an exception to this, at least so far. I still have half a dozen of these put away, so we’ll have to see if the weight of the years can eventually tame down these unruly Hondurans.